The Irish are famous for two things. One, they can drink like a fish and keep the spirit flowing. Two, they know how to take a joke. The Irish also love to joke, especially about themselves. They don't care about political correctness and other such mumbo-jumbo. For them, a below-the-belt barb is an expression of endearment. The Irish are also noted for their tremendous sense of humor. Their quick-wittedness is evident in these Irish sayings and quotes. Some famous witty Irishmen like Oscar Wilde, George Bernard Shaw, Conan O'Brien and F. Scott Fitzgerald have achieved global fame for their extraordinary wit and wisdom. Their words reveal their brilliant imagination. Embrace Irish humor on St. Patrick's Day. The Irish love their culture, history, and traditions. They love cracking jokes and drinking beer (like Guinness) and Irish whiskey (like Jameson's or Bushmill's). However, if you don't have an appetite for insults, watch out for their sharp tongue -- the Irish spare no one in their quick comebacks. 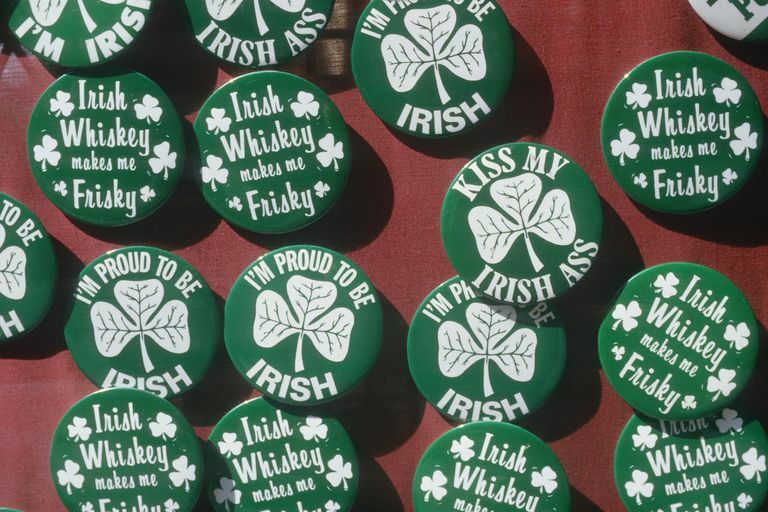 If you are celebrating St. Patrick's Day, arm yourself with witticisms to level the playing field. "The Irish don't know what they want and are prepared to fight to the death to get it." "In Ireland, the inevitable never happens and the unexpected constantly occurs." "May God bless and keep in good health your enemies' enemies." "The one thing us Irish have is the ability to laugh at ourselves. God bless us all." "The shamrock is a religious symbol. St. Patrick said the leaves represented the trinity: the Father, the son and the holy spirit. That's why four-leaf clovers are so lucky; you get a bonus Jesus." "And that's where I saw the leprechaun. He told me to burn things!" Margot Leitman, "Lewis Black's Root of All Evil"
"St. Patrick's Day is a holy day for Roman Catholics in Ireland to pray and a day for drunk people to vomit with their pants down in New Jersey." "Making it [St. Patrick's Day] a great day for the Irish, but just an OK day if you're looking for a quiet tavern to talk, read or have a white wine spritzer." "And on me final night, I got as lucky as a clover, I met a purdy lassie, drunk enough to come on over." "In order to find his equal, an Irishman is forced to converse with the Almighty." "It's a big deal about whether or not gays can march in the St. Patrick's Day parade, and I have to say that on some level I kind of see their point. Because when you think about it, it is a real macho heterosexual event. Bunch of guys in short skirts on a cart made of rose pedals sharing a bagpipe. That's not for sissies." "This is St. Patrick's Day in Los Angeles, 'Luck O' The Irish Recipes.' Delicious Irish guacamole. Corned beef and guacamole." "The legend goes that St. Patrick drove the snakes out of Ireland. I was thinking ... that must be hard to put all the tiny seatbelts on all the snakes." "St.Patrick's Day is named for St. Patrick, the first guy to feed Guinness to a snake." "Who's this Patrick anyway? The patron saint of liquor distributors? Here's the real truth, he didn't get rid of snakes in Ireland. He just got rid of the ones he was seeing." "I come from an Irish family. St. Patrick's Day was our big holiday. The night before we'd hang up our stockings and in the morning they'd be full of beer."